November | 2010 | Randy McQuien, Jr.
One of our friends, Amber, is pregnant with a little baby girl. 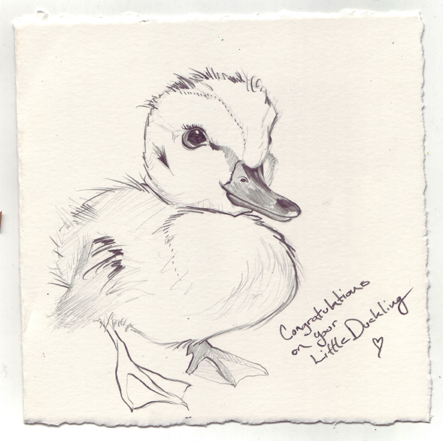 I wanted to do something quick and cute for them so we made a card where I did a sketch of a little duckling on the front. Once I get started on drawing it’s hard to stop. So it took a lot of restraint not to spend hours on a simple card. Hope they like it. I’m also researching new 3G phones and it looks like I’ll finally be stepping in to Droid technology. Over the last few days my fiance’ Janelle and I have been working a painting for our friends Megan and J0hn. Yesterday they had their engagement party and we gave them an R and J painting of two owls snuggling up against each other. They loved it. The painting turned out better than I thought it would and it maybe the first of many collaborations to come. This was a fun show Hosted by Kustom Thrills Tattoo in their Octane Gallery space. There was a lot of really good artists showing work like Charles Bennett, Dustin Dirt, Jeff Bertrand, etc. just to name a few.